Ancient graffiti carved into the walls of Roman buildings display love declarations, political rhetoric, and simple images of daily life. 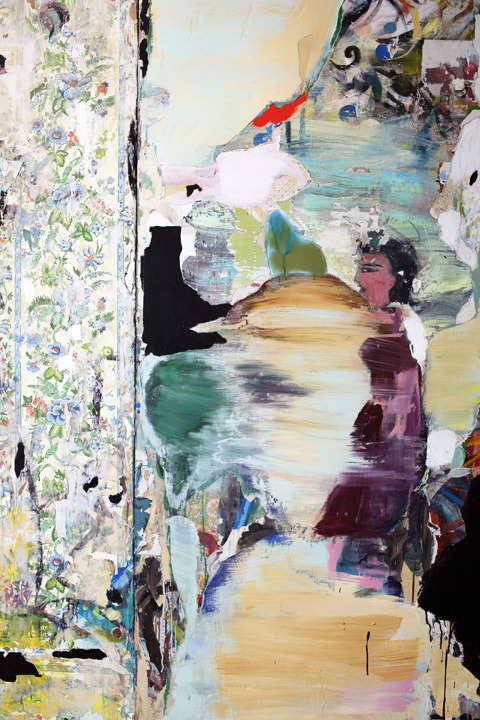 Weissglass, a New York based painter, plays with the modern equivalent. 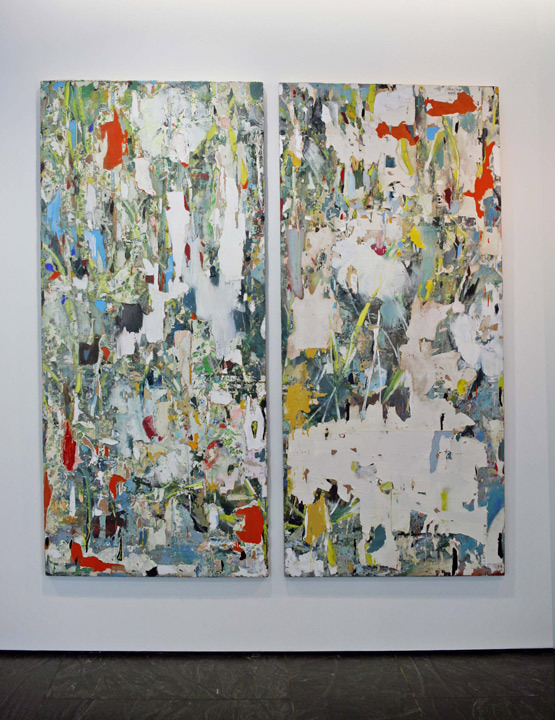 Her highly worked panels are compositions layered over frayed, stained wallpapers, recalling advertising billboards in city subway stations that have met with the hands of rebels. After applying paper, acrylic and oil paint, the artist strips her colorful surfaces only to load them back up again. The effect she achieves is a weathered, urban patina. Painted with intermittent rough and soft mark making her epic themes are further magnified by the scale of their presentation: Roulette(2008), for example, is a large work created on four wooden doors pieced together horizontally to create a triptych. Weissglass first explores her fantastical narratives in refined drawings articulated in pencil with occasional bursts of color. Many of her works depict romantic entanglements, personified by Martha and George Washington characters loving, fighting, and breaking up in dreamy American landscapes. Ladies and gents of the Revolution dress in formal attire sitting hand in hand on a surreal waterspout, while poodles idle below in The Gathering (2009). The duality of naughty and nice is evident in Midnight in the Garden (2011-15), a painting that seems to reference both Jackson Pollock’s messy drippings and Claude Monet’s gentile water lilies. The domestic sphere is a steady motif for Weissglass. As the daughter of a painter and interior decorator, she maintains a trove of old wallpaper once collected from her mother's office. She applies these papers onto wooden supports, later peeling and scratching at them. Such a stripping effect recalls a home undergoing demolition, or one that is simply old and falling to pieces. As a metaphor the doors she paints upon suggest entrances and exits. In the large pieces this architectural detail has a subtle but intrinsic scale to the human body; the weight of the material and its meanings is tangible. Jeannie Weissglass was born in Morristown, NJ; she has studied at the New York Studio School, The Fashion Institute of Technology (New York), and L'Ecole des Arts Decoratifs (Nice, FR). She has displayed work at Artist's Space, Ethan Cohen Fine Arts, Gasser Grunert, and Farrell Pollack Fine Arts. Her work has been featured in several recent group shows, including Cliffhanger at The Royal Society of American Art in 2014, Paper Reveries at the Shirley Fiterman Art Centerand 647912 at Galerie L'inlassable, both in 2015. Her most recent solo exhibitions are Riptide: Journeys in Early Americana and Beyond at Cathouse FUNeral, and Drawings at the Melville House, both in Brooklyn, NY. Her work has been noted in The Village Voice, Elle Decor, and NY Arts Magazine. From 2011 to 2014 she was the director of SHOW ROOM, an independent gallery of contemporary art in the Lower East Side and Brooklyn, NY. 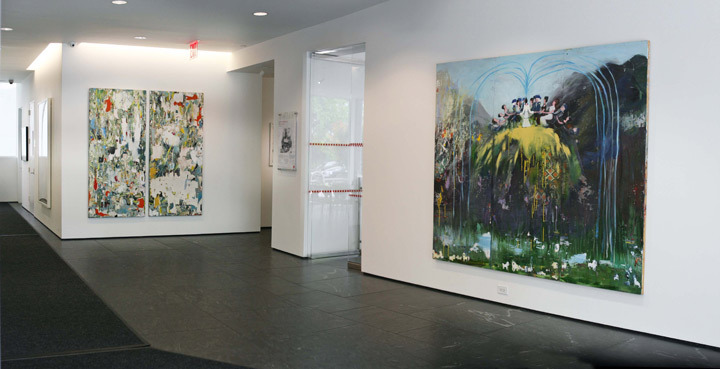 The gallery received mention in The Brooklyn Rail, The New York Times, Art in America, Artforum, and Frieze.